The mammoth question in current competitive stressful world is: Is there a master key to relieve stress and ensure Stress Free Living? Of course, being a doctor, you are aware of many ways to escape from stress, but while advising to patients, you also become victim of micro-stress for which the remedies are being swallowed only when it is too late. 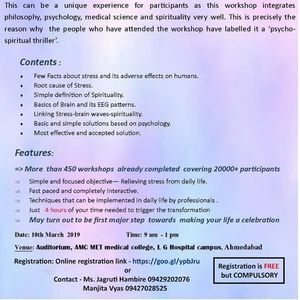 Key To Stress Free Living (KTSFL) workshop has seen huge success across communities and professionals including 4 back-to-back superhit workshops for doctors in 2015. 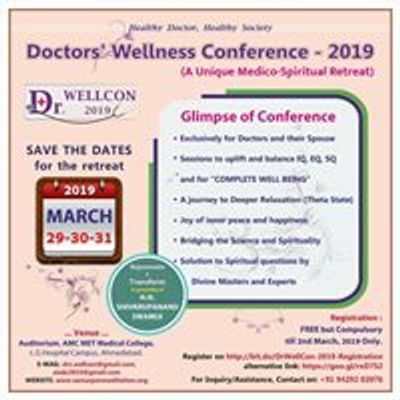 This time again KTSFL is being organized, as a preconference workshop for DrWELLCON-2019. 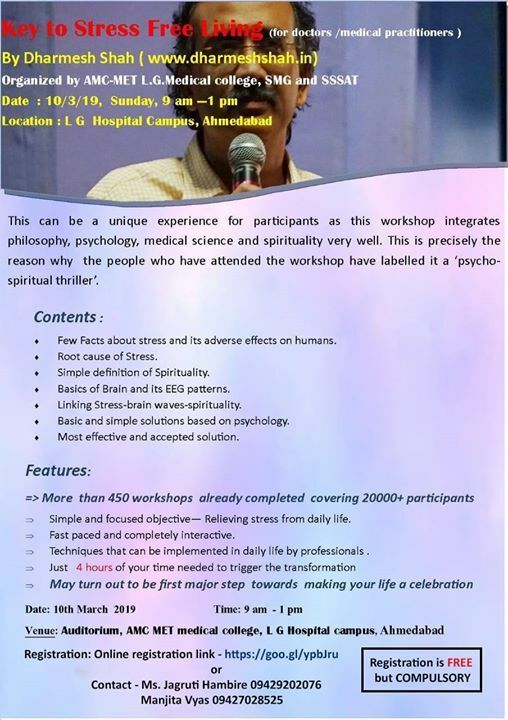 Please fill up the registration form by clicking on https://goo.gl/ypbJru to attend the Key To Stress Free Living workshop at Ahmedabad on 10th March, 2019 at 9am to 1pm at Auditorium, AMC MET Medical College, LG Hospital Campus, Maninagar, Ahmedabad. And yes, THE PARTICIPATION WILL COST YOU ONLY TIME, NOT MONEY!!! Our registration team will mail you about confirmation of your registration.